One of the two whiskeys in Tipperary's Boutique Selection. Only six first-fill bourbon casks are chosen for each batch of Watershed, carefully selected for quality by Malt Master, Stuart Nickerson. After being cut to 47% with Ballindoney water every bottle is numbered individually. 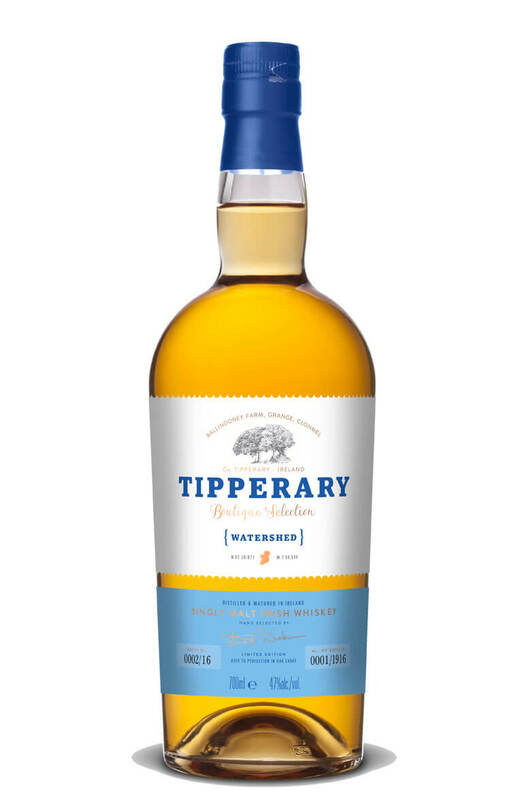 Ballindoney is the farm where Tipperary plan to build their distillery and this is the first whiskey to be cut with water from this source, hence the name 'Watershed'. Nose Lots of interesting aromas on the nose. Touches of fresh oak and mashy, barley notes. Aeration softens the spirit bringing some fresh lemon, melon, apple, minty/herb and spice notes. Palate Softer and sweeter than expected. Really nice lemon meringue, vanilla, apple sauce fruit flavours combined with some barley grain, fresh oak and cinnamon notes. Types of Barrel used for Aging Sourced from six ex-Bourbon barrels. An eleven year old single malt bottled by the Tipperary Distillery. This was double distilled at an .. The first of our Limited Edition Mountain Range, “The Knockmealdowns” is created from on..
A special 'exclusive' bottliing from Tipperary that has been finished in a single red wine c..